Way back in what seems like a lifetime ago, I lived on the island of Oahu in Honolulu, Hawaii. 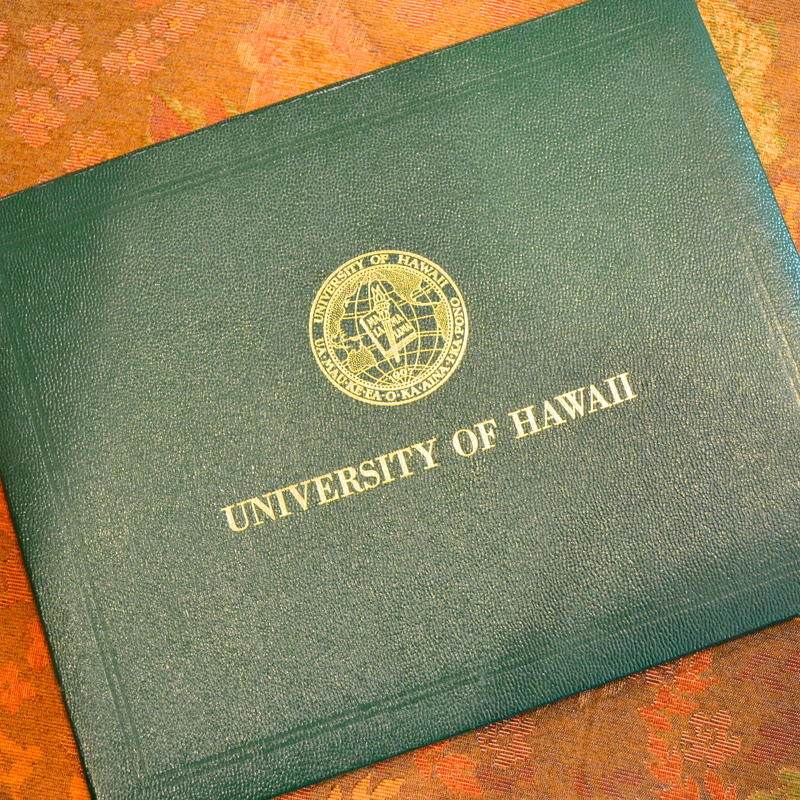 I attended the university of Hawaii where I earned a degree in Home Economics Education. I lived in Hawaii for a total of 8 years and taught Home Economics to high school students. One day when I was shopping in a local grocery store they were handing out samples of a delicious chicken curry dish made with thick Udon noodles. 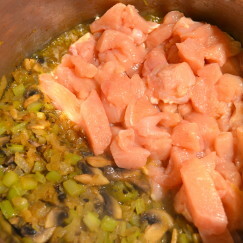 They were also handing out the recipe for this delicious tasting dish. 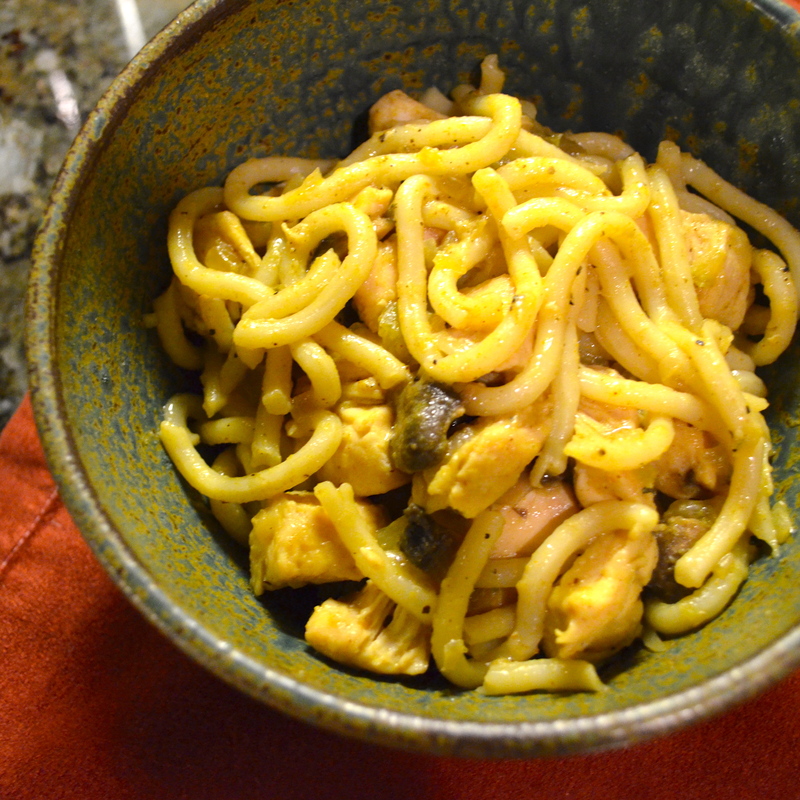 I have long since lost the original recipe card, but ever since that day in Hawaii I have been making Udon Noodles with Curried Chicken for my family and friends to rave reviews. 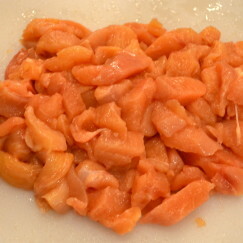 And my Hawaiian Home Economics students loved it too! 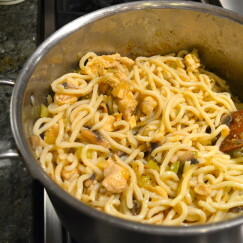 The recipe is quick and easy to make, and I’d rank it way up there in the “Comfort Food” category. As you might imagine, when you reside in the Aloha State you get a lot of visitors. 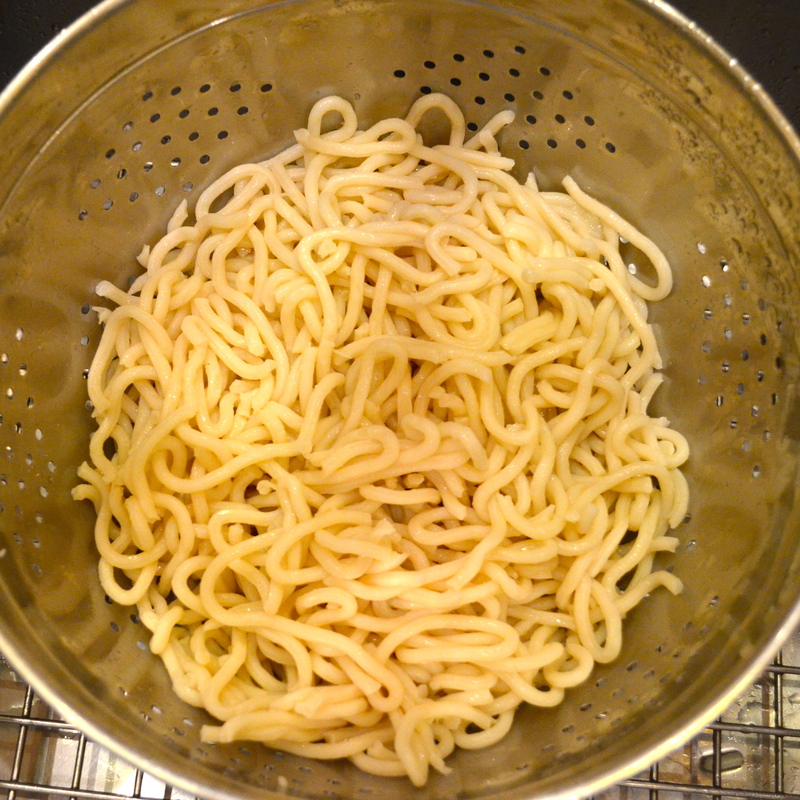 In fact, when you live in Hawaii, people you didn’t even know were your friends appear out of nowhere claiming to be your long lost best buddy. 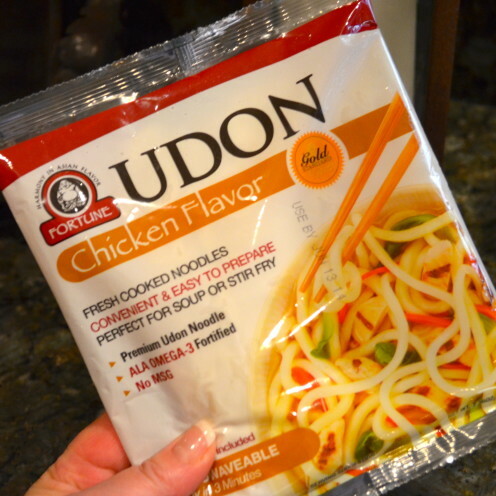 Back in those days, mainlanders had never even heard of Udon noodles. 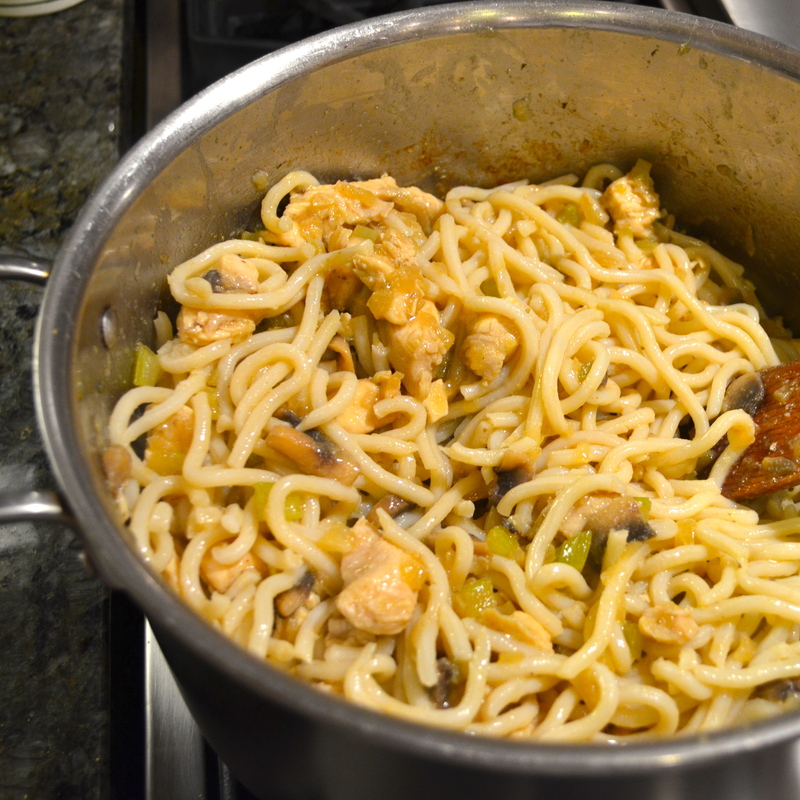 But I often made this recipe to the delight of my Hawaiian houseguests, who always wanted to take a boatload of Udon back home with them. I have found it to be a universally liked recipe that I’d like to share with you here. 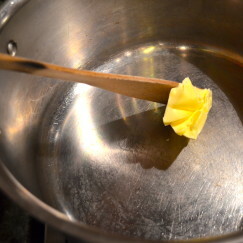 To get started, you will need either a stick of butter or 1/2 cup of buttery spread. 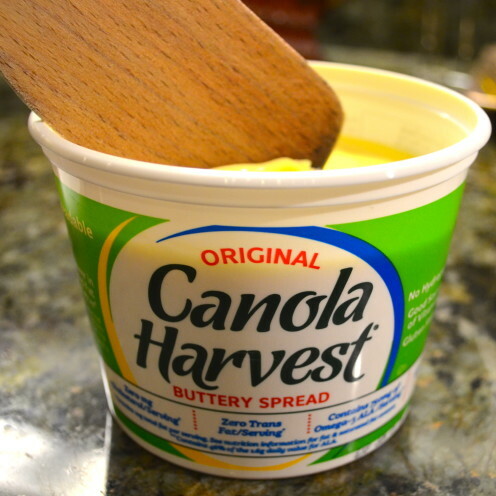 I’ve mentioned before that when a recipe calls for butter I often substitute Canola Harvest Buttery Spread which has zero trans fats, zero cholesterol and is loaded with omega 3’s. Either way, get it to melting in a large pot on low heat. 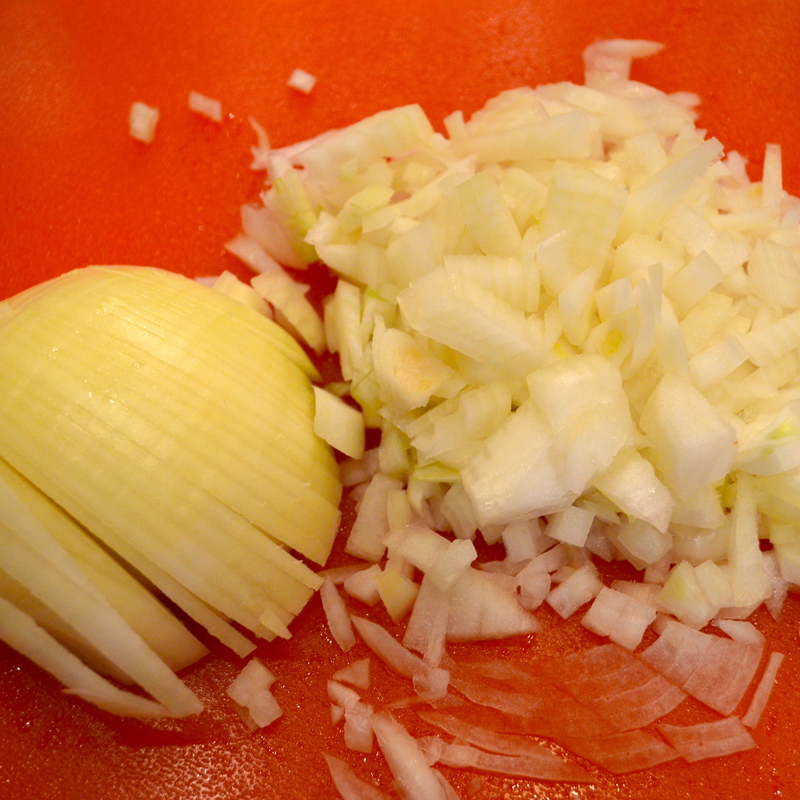 Next, you will need to dice up one large brown onion. 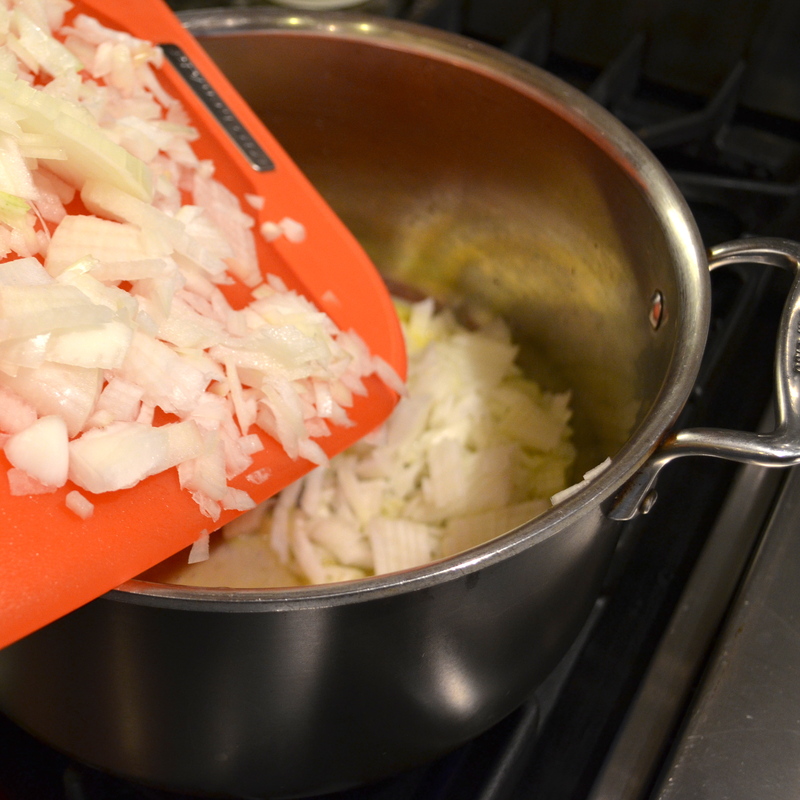 Add the diced onion to the pot with the melted butter and begin to cook them on medium low heat. 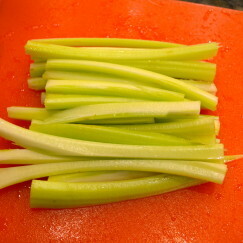 Meanwhile, wash 3 stalks of celery. 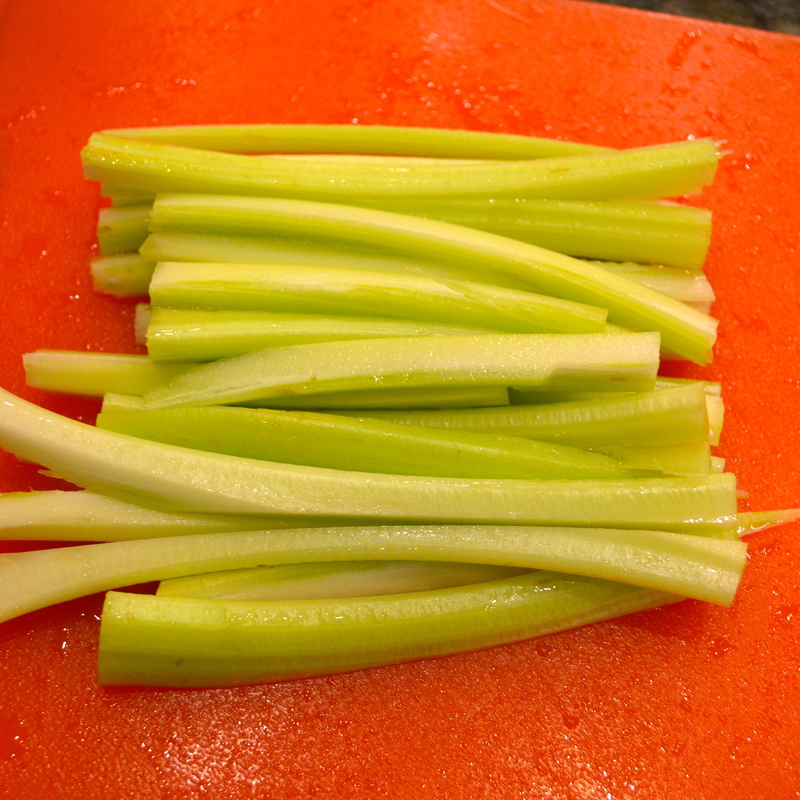 Slice the celery in long, thin strips, then dice them up. 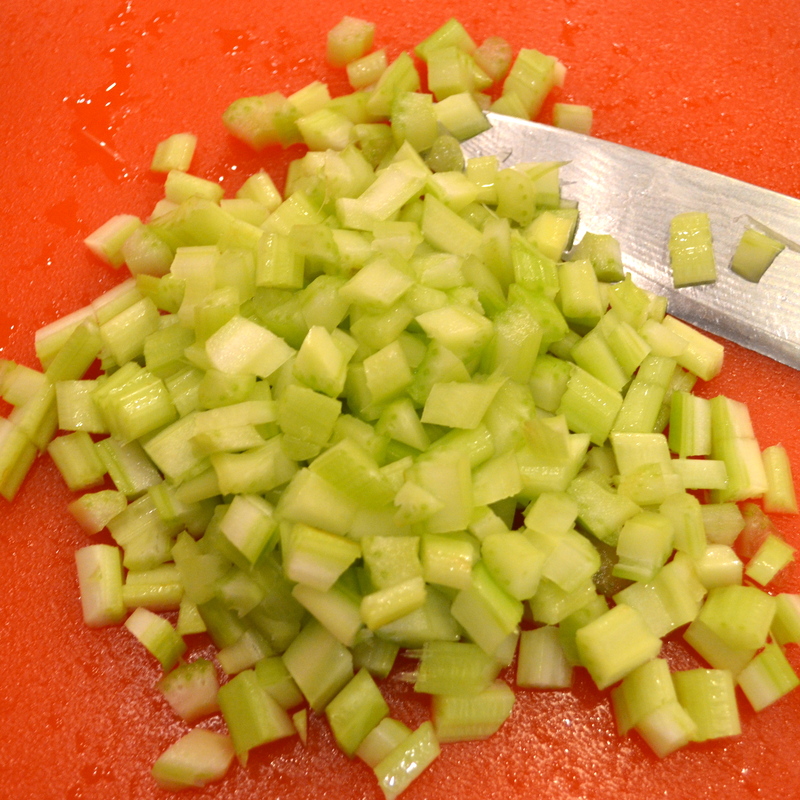 Remove the inner leaves from the core of the celery stalk and dice them up as well. 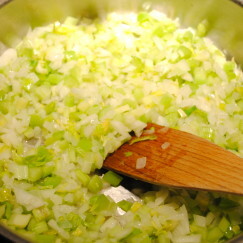 Add the celery and the celery leaves to the pot with the onions. 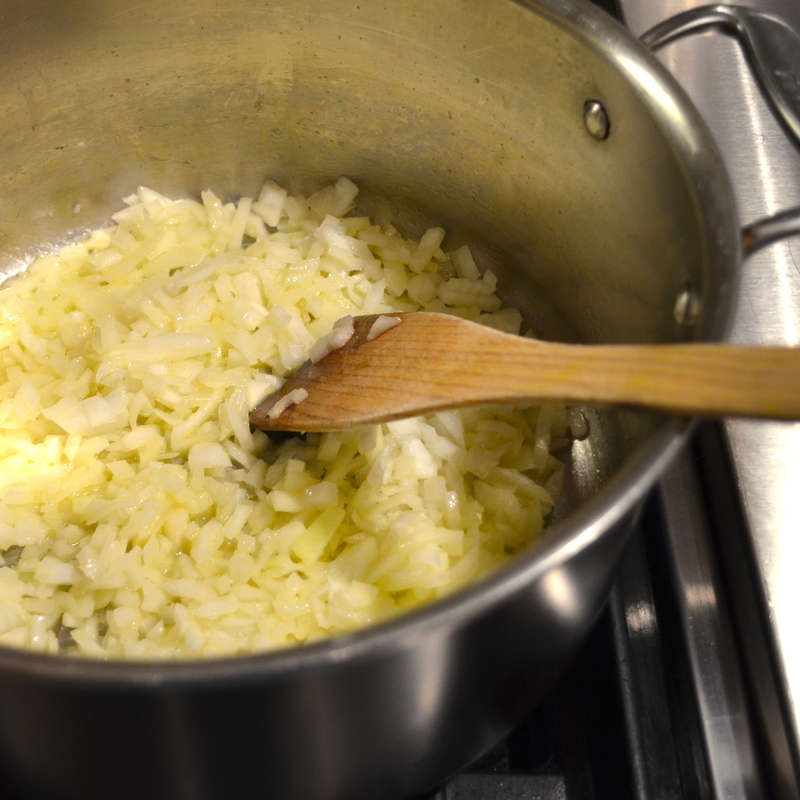 Give the vegetables a stir. 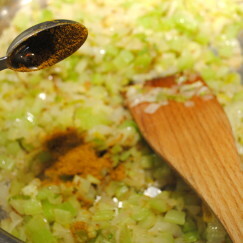 Then add 1-1/2 teaspoons of curry powder to the pot and give it another stir. 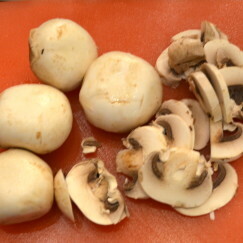 Now, clean and slice 6 large button mushrooms. 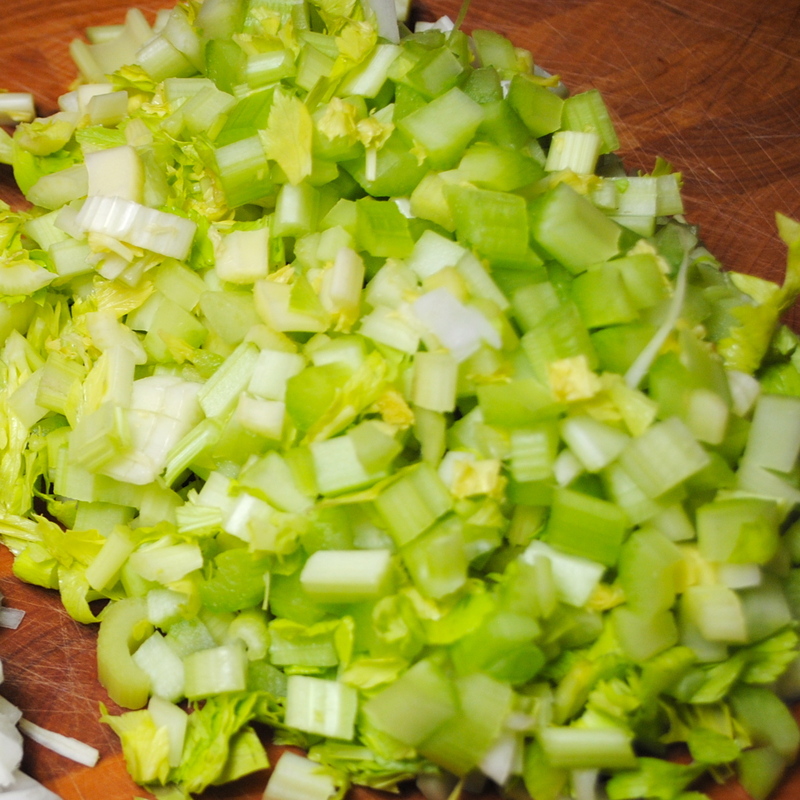 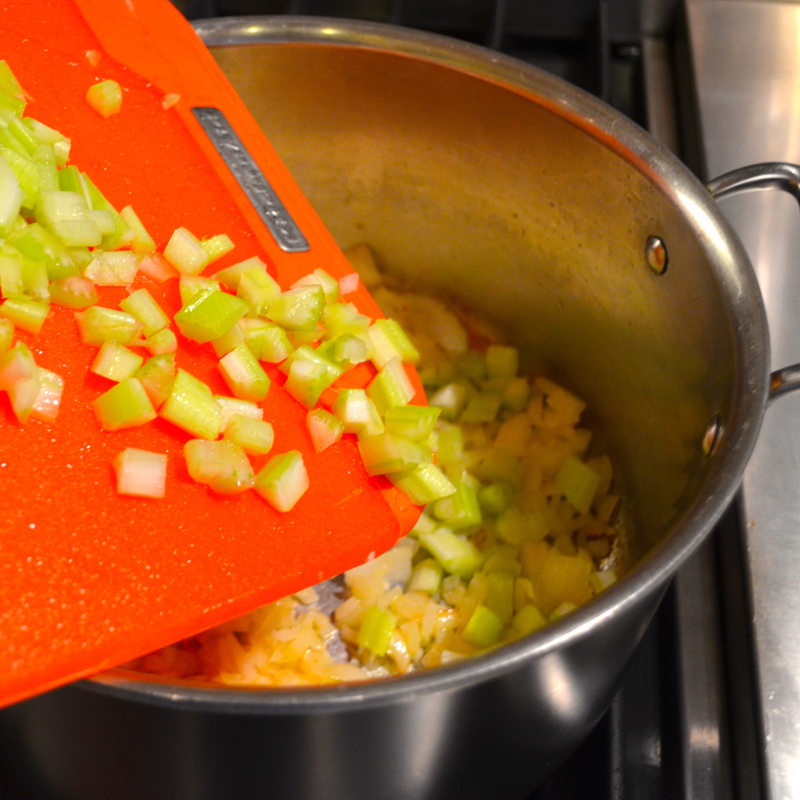 Once sliced, cut them in half down the middle and add them to the pot with the onions and celery. 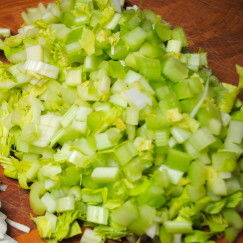 Continue cooking until the celery and mushrooms become tender and the onions translucent. 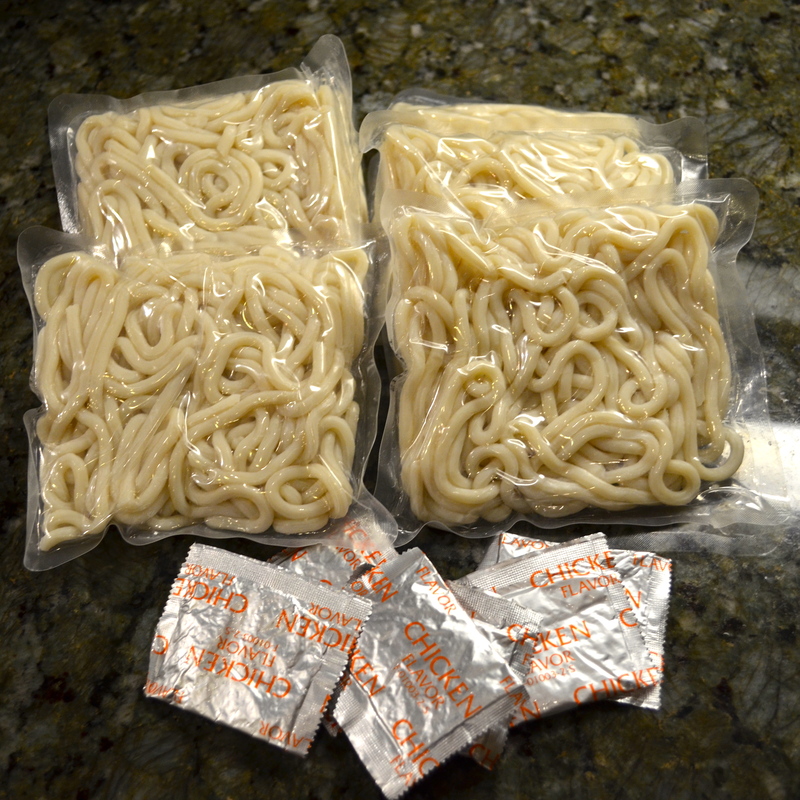 Now you will need 6 packages of Chicken Flavored Udon Noodles. 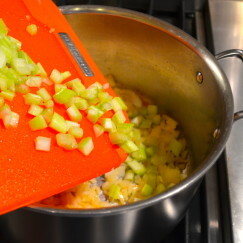 Next, cut up 3 boneless and skinless chicken breasts into small, bite size pieces and add them to the pot. Cook on medium low heat, stirring the pot regularly until the chicken is fully cooked. In the meantime, return to your 6 packages of Udon noodles. 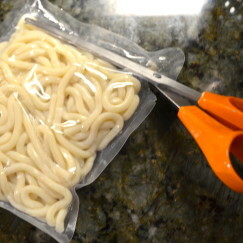 Cut the packages open with scissors, place a colander in the sink and plop the noodles into the colander. 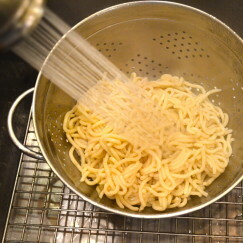 Run warm water over the noodles and use your hands to loosen them up. Add the drained noodles into the pot of vegetables and gently stir to incorporate, being careful not to break the noodles. 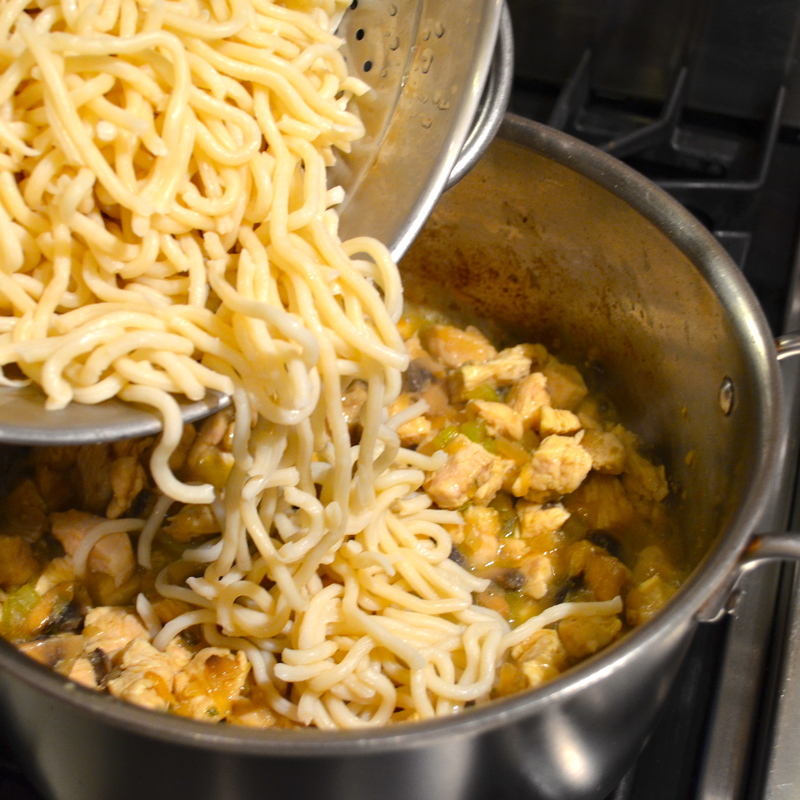 Cook on medium low heat until the noodles are heated through. 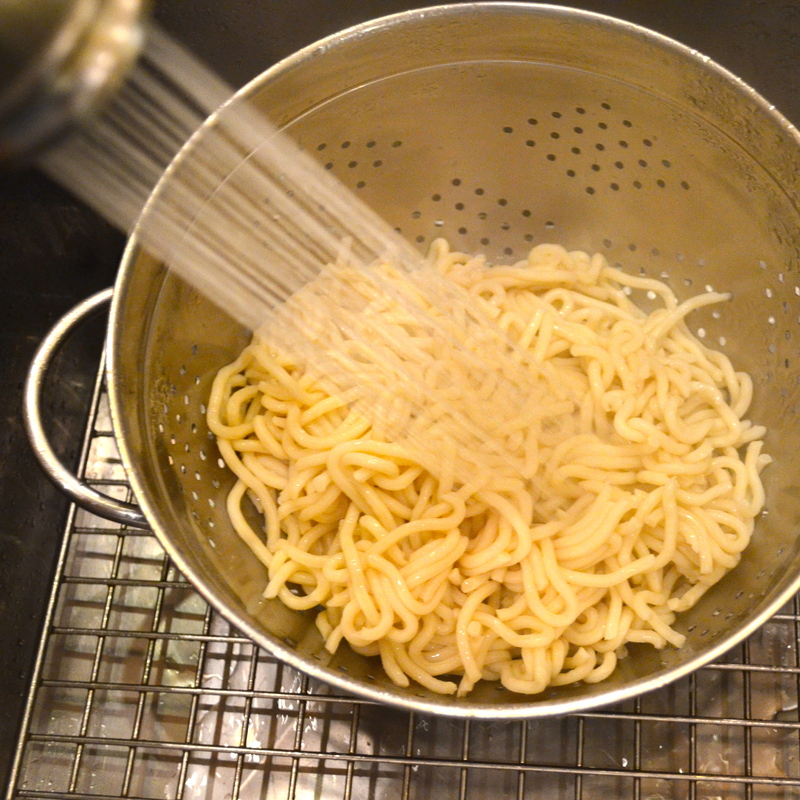 Now give those noodles a try. 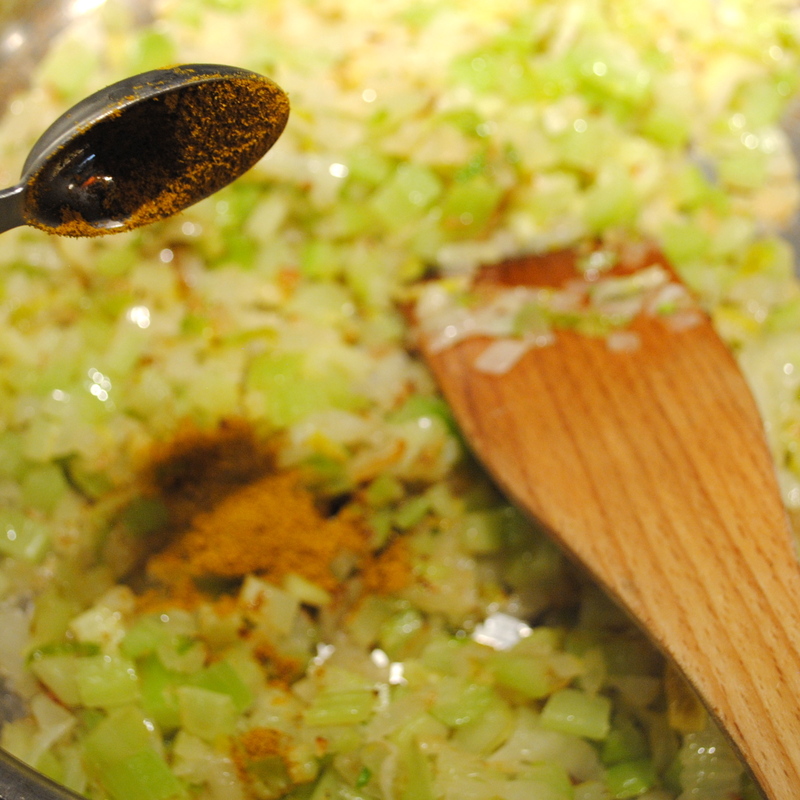 Add coarse ground pepper to taste. 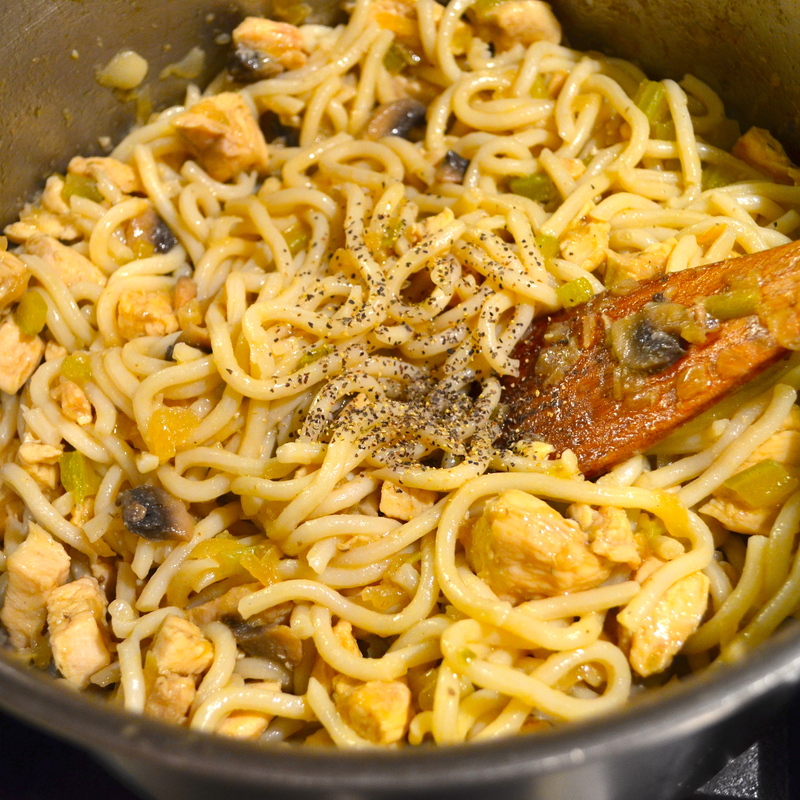 The chicken flavor packets you added earlier contribute most of the salt to this dish. However, you may wish to add a little salt at this time as well. 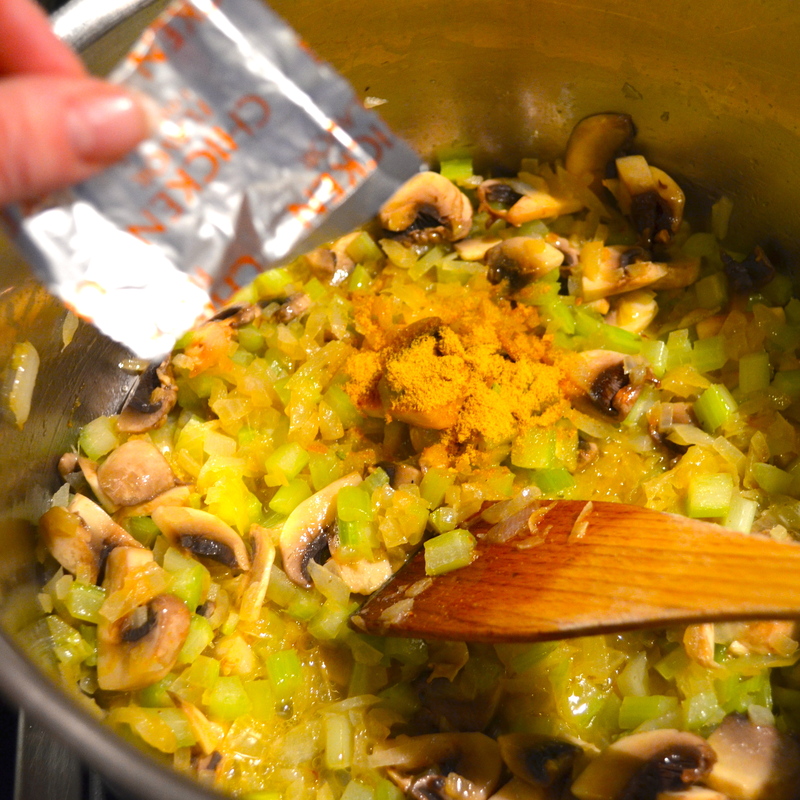 Mix in the salt and pepper. Once thoroughly heated, the Udon Noodles with Curried Chicken are ready to serve. 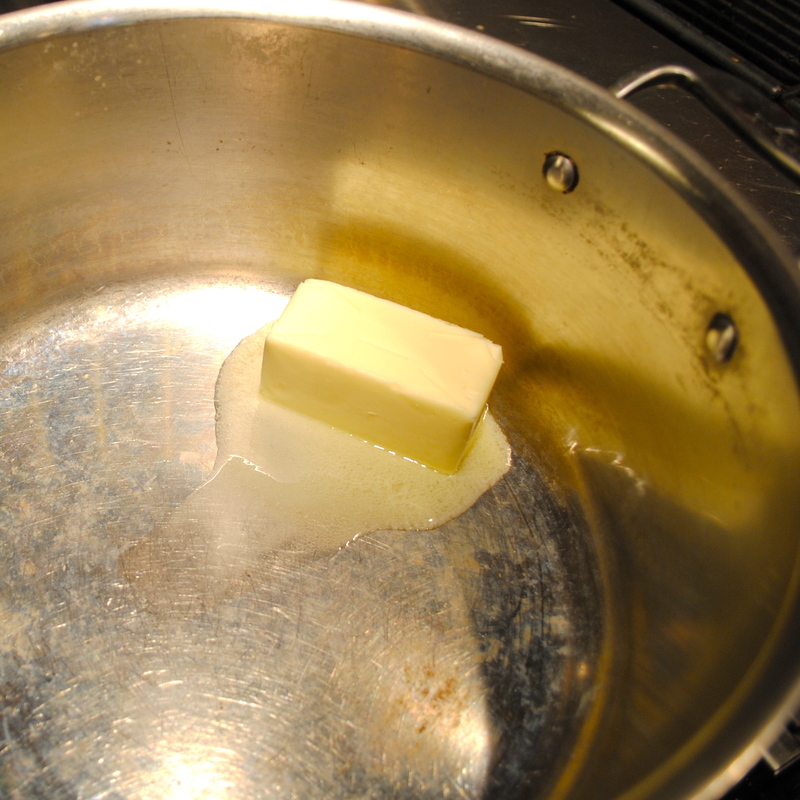 I usually serve this dish with a green salad on the side. A delicious and creative way to prepare udon noodles. 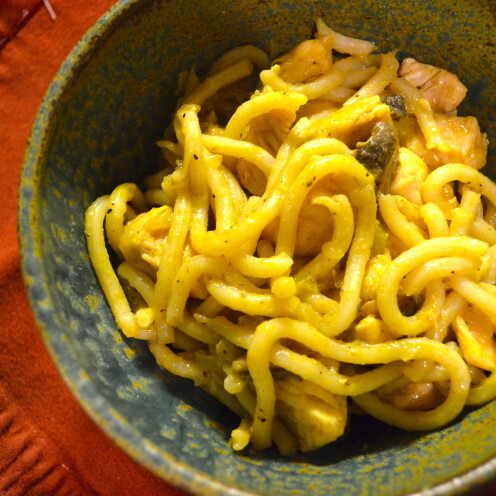 This recipe for Udon Noodles with Curried Chicken is enjoyed as a main course rather than as a soup. Add diced onions, diced celery, celery leaves and sliced mushrooms to the pot and begin cooking over medium low heat, stirring regularly. 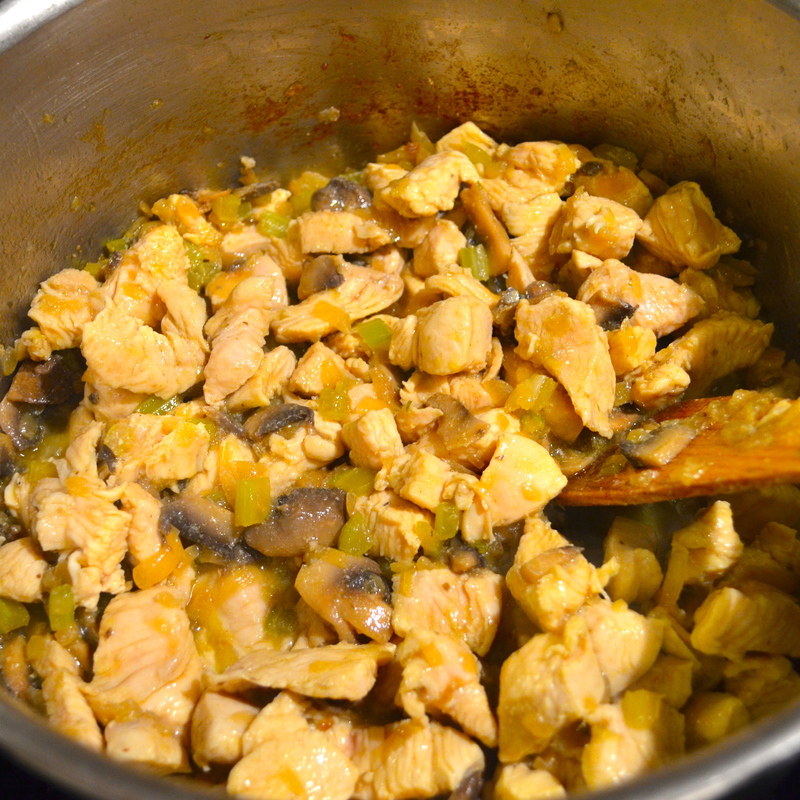 Add 1-1/2 teaspoon curry powder and 6 chicken flavoring packets to the vegetables. 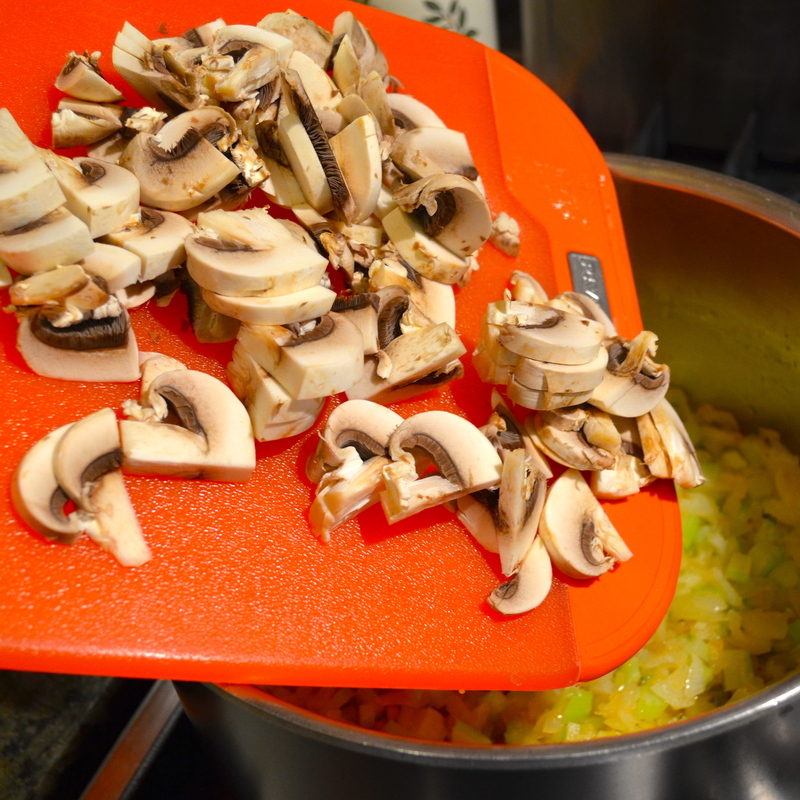 Cook until the celery and mushrooms are tender and the onions are translucent. Add the chicken to the pot of vegetables and cook until the chicken is fully cooked. 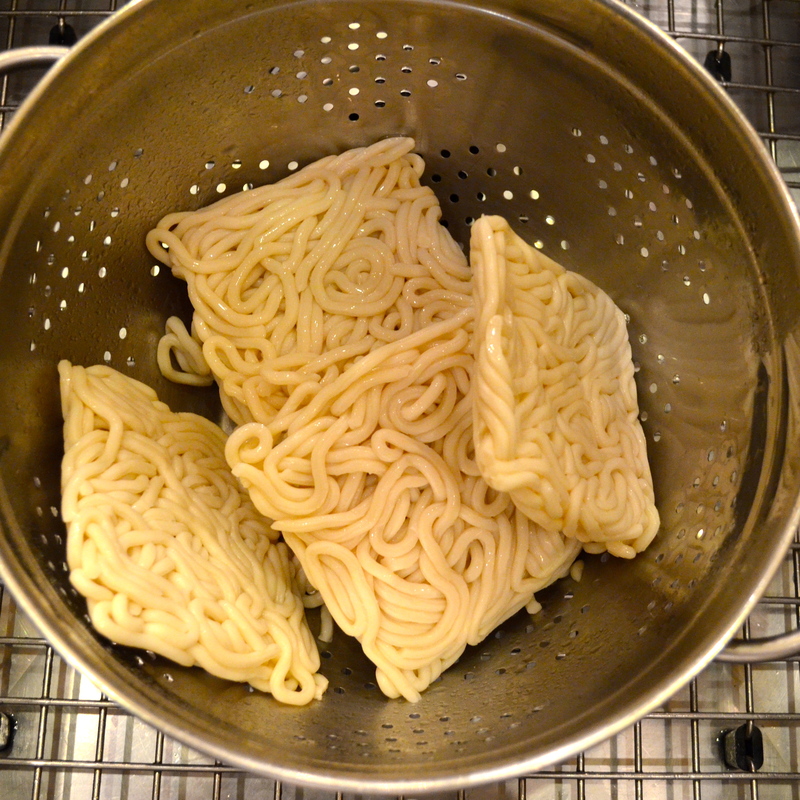 Place packages of Udon noodles in a colander and rinse them in warm water, using your hands to separate the noodles. 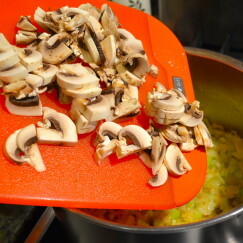 Add the drained noodles to the vegetables and gently stir to incorporate. 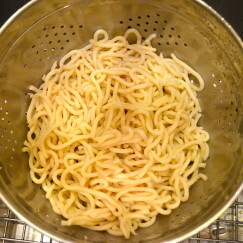 Cook on low until the noodles are heated through. These noodles make a great main course served with a tossed green salad.